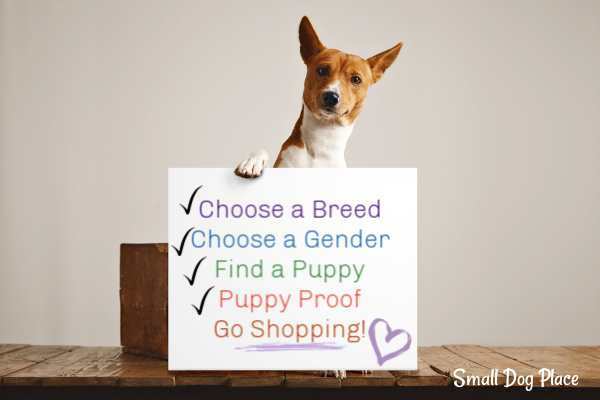 Small dogs are become surrogate children and just like shopping for children, fur baby parents enjoy shopping and purchasing for their "children" as well. But no one likes to waste money and everyone wants a good deal, so we're here to help. Whether you are a new fur baby parent that needs guidance on what you will need, or an experienced dog owner who is looking for ideas, we want to help. AND, just in case you happen to be the aunt or uncle of a new fur baby, we'd like to provide some ideas for gift items to. Let's start with the essentials and go from there. 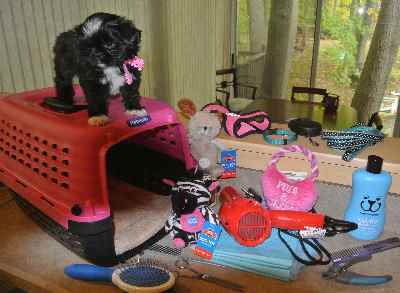 There are definite advantages of shopping for small dog supplies as opposed to those needed for large and giant breed dogs. The biggest advantage is the cost. Fewer Supplies that need to be replenished frequently such as shampoo, wee wee pads, cleaning supplies because you use less for a small dog, thus you save money. One of the items in each list have links to other pages on this website. Those pages are either product reviews or how to pages. For new puppy owners, I highly suggest browsing around this website. With almost 500 pages now, there's information you'll find helpful for welcoming your new puppy or adult dog into your home. All new puppies need the following items no matter what breed. That list is long but doable but most people don't stop there. There are two more lists, one for more essentials as the budget allows and the last is for luxury items that are fun to have. I review items from time to time and give you my (almost) unbiased opinions of what works and what doesn't work. Click on any link above and below to read more about the products, how you use them, why you need them, and which ones are best. Bookmark this page and check back often as the site is constantly evolving. Depending on your budget, a few more supplies might come in handy. Depending on your circumstances, these items may or may not be a luxury. Is this list complete or have I forgotten some important equipment, tools or items that you think should be added? Please use the contact form. I'd love to hear from you. If you have an item that you use regularly and would care to share your opinions and recommendations with the readers of Small Dog Place, we'd love for you to do so. Use the form below to tell us about your favorite product. Remember, these reviews are from our readers and may or may not be those of Small Dog Place. We reserve the right to remove any comments that we deem inappropriate for this website. If you are getting a new dog or puppy, may I suggest you check out these helpful articles.